Interactive Map Location of Nasca Town in Torren. Nasca Town is a town located in the northwestern Torren region. It is renowned for growing food and crops that are used to supply the rest of the region. A Power Farm is hidden to the north of town which is likely to act as a power source for the entire town. Walk up the sets of stairs towards the Safari Zone in the northeast to observe a scene relevant to the storyline. Exit Nasca Town through the Nasca Cave in the east. A place to capture Pokemon with 30 safari balls for 500. It serves as a major source of income for the town along with the profits made from farming. The lady in the northwesternmost house can teach any of the core series or Delta versions of the core series starter Pokémon Frenzy Plant, Blast Burn or Hydro Cannon, provided that they match the Pokémon's type(s). Nasca Town is connected to a windfarm that is accessed from an extremely thin dive spot in the northwestern pond. Though the area is small and may not seem to hold anything of interest, it is home to a Delta Pawniard. A lady in the westernmost part of town is willing to sell Moomoo Milk to the player for 500 per bottle. Wild Pokémon can be encountered by surfing or fishing in any of ponds in the town, in the cave leading to the Power Farm, as well as by exploring seaweed while diving. 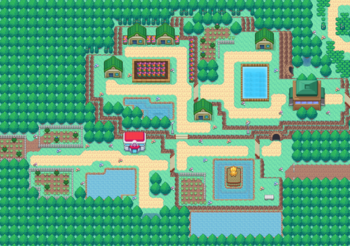 A man in the house to the northeast of the Pokémon Center will give the player either a Bulbasaur, a Charmander, or a Squirtle after finding the Old Photo in the Safari Zone. Interacting with any of the TVs in the city's houses has a chance of spawning a Rotom. This page was last edited on 17 February 2019, at 12:55.